To mark Via Campesina’s International Day of Peasant Struggle, family farmers and their allies will once again be converging on the doorstep of the Chicago Mercantile Exchange (CME) – 141 W. Jackson – at Noon on Fri. April 15th to expose the price fixing by commodity speculators that is behind the ongoing global food crisis. Dairy farmers in particular are calling upon the Dept. of Justice (DoJ) and the Commodity Futures Trading Commission (CFTC) to take action against the food giants that are continuing to defy anti-trust rules and manipulate markets for their own private gain. At the CME rally, FFD will also be launching a nationwide consumer boycott campaign against one of the worst dairy market racketeers. For more on the corruptive influences behind the CME, see below. 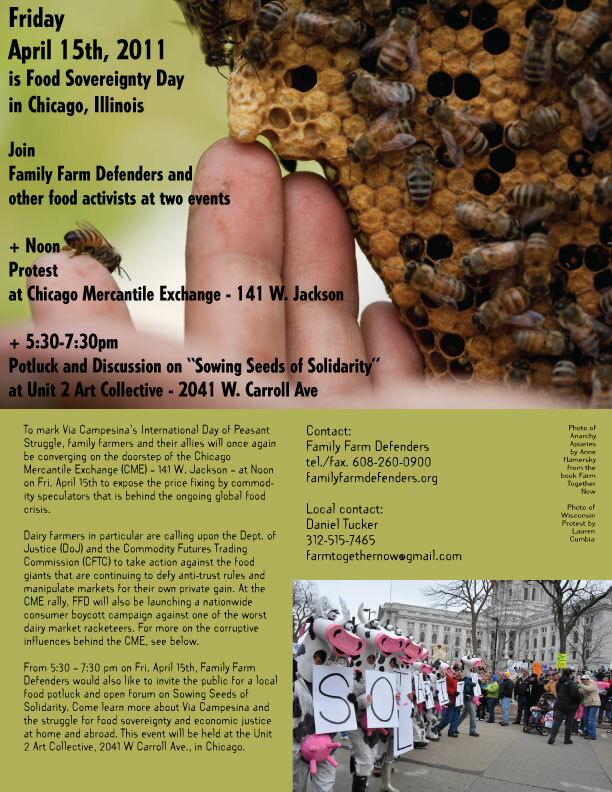 From 5:30 – 7:30 pm on Fri. April 15th, Family Farm Defenders would also like to invite the public for a local food potluck and open forum on Sowing Seeds of Solidarity. Come learn more about Via Campesina and the struggle for food sovereignty and economic justice at home and abroad. This event will be held at the Unit 2 Art Collective, 2041 W Carroll Ave., in Chicago.